← Are You Small Town or Big City? A lazuli bunting, a gold finch, a downy woodpecker, a hairy woodpecker a nuthatch, several lark sparrows, an eastern king bird and a western wood peewee… all in the space of 10 minutes on a walk at a small recreation area near my hometown on Wyoming. .. I would have missed most of them if my son and daughter-in-law, excellent birders, had not been with me. All this rich bird life caused me to think about the science writer, Richard Panek’s book The Invisible Century, which is about Einstein and Freud. What Panek shows us is that clearly relativity and the human unconscious existed before these two men articulated the ideas, but it took people who were looking differently at the world, who were not willing to just continue “seeing” what most people were seeing to make those ideas part of the culture. Thus these men were able to articulate ideas that have become part of our cultural conversation, ideas that had not been there before although the structures that allowed these men to articulate these ideas clearly existed. Marion Zimmer Bradley, in her fantasy novels about her invented planet Darkover, calls characters who do not have psi powers “head blind;” they cannot read others’ minds, or see future events. While Bradley’s work is clearly speculative fiction (and good fun at that), the idea that we see what we want to see, or understand what we want to understand is worth thinking about. So, as I walked the trail in our small recreation area this morning, I realized that I was seeing tracks I might not have seen that looked like horse prints in the gravel. At another time in my life, or even on another day when I hadn’t been primed by seeing so many birds early in the walk, I would missed at least half of them if I had not had expert guides. As I walked along, I thought about Panek’s book, about being head blind. And then I began to think about what we, as community college teachers are doing about remedial education. We spend a great deal of time thinking about how to improve our students’ math, reading and writing skills. These are important, but what if we are not seeing something more important? What if the deficiencies that we are seeing are NOT the most important deficiencies in our students? We see the obvious, the inability to do fractions, or the inability to write a complete sentence, but what if we are missing something more basic? Can we remove our blinders and become less “head blind” and look more deeply into the problem? Can we become good trackers? 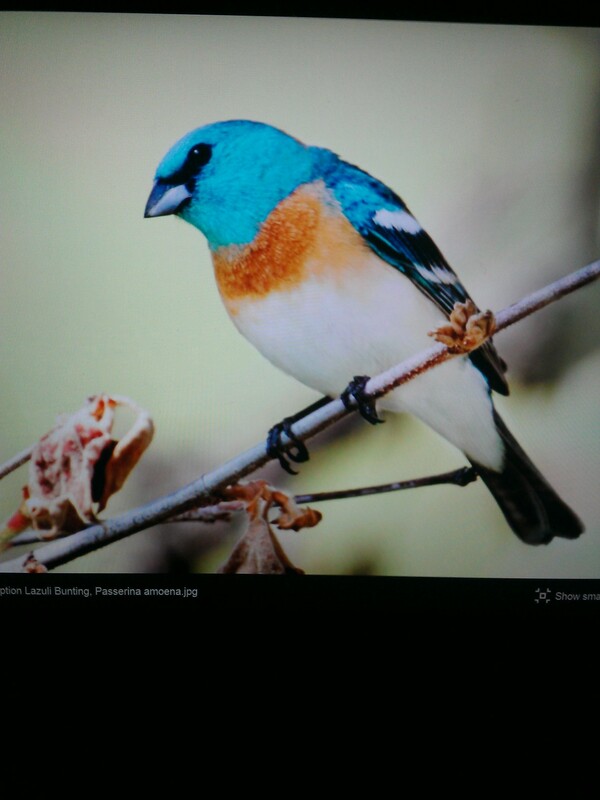 How do we see the lazuli buntings among the grasses, catch the flash of blue as it chases the yellow gold finch? How do we become astute observers of our students? I suspect that the deficiencies that we are seeing are part of a broader problem, that we can attempt to fix these things, and we may make progress. There are larger forces are work here, but as educators, we aren’t seeing them. The tracks in the grass or on the gravel path look like random indentations, not like a logical pattern of hoof prints. I would love to see a group of people, not just educators, gather together and stretch themselves as they think about the problems that might be underlying the need for remedial education. What are the hoof prints we are missing? What patterns might emerge if we moved beyond the basic subjects and thought about the larger forces at work in our students’ lives? What flashes of blue might we see among the dry grasses? Poetic and astute. Nice work. The timing on this idea is so good Jane! Here’s to a semester of NOT being blind. teaching requires so much patience…. but it’s so rewarding when someone really gets it… I had a student last semester// a 50 year old ex- deputy sheriff who had been in my comp I class and had done very well.. in comp II he had to write a paper about some war poems.. He came to me and told me he couldn’t do it..I told him I knew he could but told him to spend 1/2 an hour writing about why he couldn’t do it// .. He had lost people in wars// He was an Air force vet… it was really hard for him to do … but eventually he wrote an eloquent and thoughtful paper .. as I knew he would..